A team of researchers from MIT’s Computer Science and Artificial Intelligence Laboratory (CSAIL) and Boston University (BU) has developed a robot that can be controlled using the human mind. 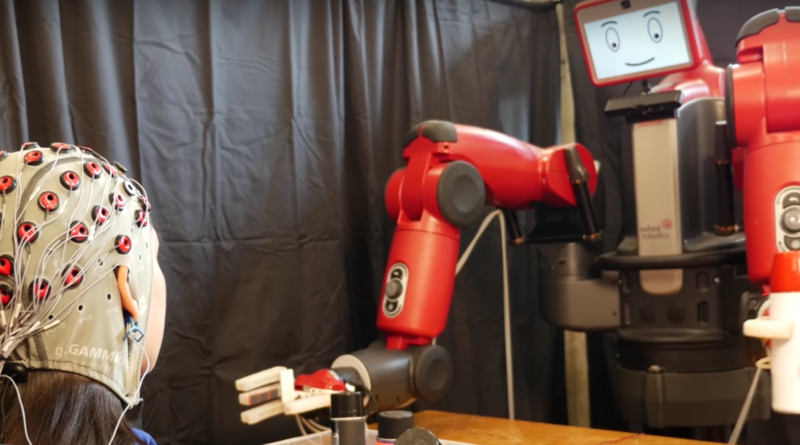 The team from MIT and BU used a humanoid robot named “Baxter” from Rethink Robotics – the company headed by iRobot co-founder and former CSAIL director Rodney Brooks. The MIT and BU research team uses data from an electroencephalography (EEG), a system that records brain activity, and machine-learning algorithms that enabled Baxter to classify brain waves in the span of 10 to 30 milliseconds. The team, under the supervision of CSAIL Director Daniela Rus, focuses on brain signals called “error-related potentials” (ErrPs) – generated whenever our brains notice a mistake as the robot performs a task. Whenever the robot specifies which choice it intends to make, the team’s system uses ErrPs to find out if the human concurs with the decision. “As you watch the robot, all you have to do is mentally agree or disagree with what it is doing. You don’t have to train yourself to think in a certain way – the machine adapts to you, and not the other way around,” Rus told MIT CSAIL News. “Given how difficult it can be to translate human language into a meaningful signal for robots, work in this area could have a truly profound impact on the future of human-robot collaboration,” said Wolfram Burgard, a professor of computer science at the University of Freiburg. Burgard was not involved in the research.